Baal HaSulam, “Introduction to The Study of the Ten Sefirot“, Item 119: This is also why the great privilege, when one is awarded sentencing himself to a scale of merit, is still not enough for one to attain whole love, meaning the fourth discernment. This is so because now he does not attain His merit as being good who does good to the good and to the bad, but only His Providence over him. On the way to complete adhesion and attaining the goal of creation, we attain all our deficiencies and all of the Creator’s actions on us during the whole process we have been through when the upper Providence was concealed. Then a person sees how in all the stages, in everything he has been through, the Creator was good and benevolent to him in absolute love. As a result, a person feels that he loves the Creator back. But this isn’t enough, since he also has to work on the future, so that he will keep the same attitude. This means that he has to develop vessels inside himself that are called faith and confidence, so that in every stage in the future he will not lose faith in the Creator’s love for him. Even this is not enough in order to determine that the Creator is good and benevolent, since it is all true only with regard to a person himself, and now he has to determine the same thing in regard to everyone else. This means that at the end of correction, he attains everyone’s end of correction, and from this point he sees the whole human history and the entire path all the souls have gone through in the process of their correction. These separate souls discover the connections between them above the sea of hatred in which they are immersed that separates them and keeps them apart. Through these connections of love, they feel how the sea of the ego separates them, and thus discover that the Creator constantly takes care of them in the best possible way, and that all the sufferings, the blows, and the problems that they have been through during all of human history and the ascent of the souls through all the worlds until the world of Ein Sof (infinity) were all out of the Creator’s great love. When a person ascends the spiritual ladder, he becomes detached from his ego as he ascends, and then he sees that it was only in the ego that he felt the afflictions. If it weren’t for the ego and the desire to receive for himself at the expense of others, he would always feel only the love and great care of the Creator for him. This means that he sees and understands that all the negative feelings don’t come from the Creator, but rather stem from his connection to his egoistic desires. Thus he determines that he is in contact, in a covenant with the good and the benevolent, and that this connection, this covenant, is full of love. Question: How is the soul connected with the body? Answer: Only the soul exists; whereas, our body and all the other physical bodies around us are imaginary existence, given to create the start of an altruistic connection between us, so that we will not create an egoistic connection between us but an altruistic connection, and to the degree that it is created, our body (and all of physicality as a whole) will take up less and less space in our consciousness, until it absolutely disappears from our feeling. Question: Is it possible to move backward in time? Answer: Yes, it is possible. If I manage my states, then what I feel in the desire to receive, which is part of me now, is my present. I can go down and divide my desire again into parts, and this will be my past. And I could make some kind of calculation about the future, where I have not connected with others in the meantime. That future connection is my future. Question: But why would I suddenly want to go back? Answer: Maybe I will want to be clothed in a smaller desire so as to connect with new people on their level. But basically, I only want to go forward, to the future, to greater and greater connection with all the desires that exist in humanity to merge them into one desire. And then I will receive a complete fulfillment that is beyond time. There is no time there anymore, no space; everything is found in one desire. After all, in all of reality there is nothing besides the substance, which is the desire to receive. Question: What is this feeling? Answer: This is a very pleasant feeling, it is impossible to say more! But it is necessary to learn the method: to learn to immerse into it to raise myself to a good life with its help, which is found beyond time. When going out to the external public, a person stands before them as before an exam: “A wonderful group in a world where everything is corrected except for me; I stand facing my uncorrected desires; all of this is a part of my soul. That is what Abraham said to the inhabitants of ancient Babylon when trying to convince them that all were one single whole, that one should not quarrel with another, because if we separate, things will be much worse. Conversely, we need to come together. So we go out to the general public with this plea. They need to feel our warmth, that we are not doing this formally, but whole-heartedly. And people will respond to this. But we need to prepare ourselves internally. We need all the desires that were torn from us; we need to join them to us. Question: So what touches my friends…? Answer: The friends are also your desires who are already prepared to create one single heart together with you; whereas, the masses are not yet ready. But they all belong to one heart, one desire, your personal desire. Each one of you has his own private universe, his own private world. And everyone, except for you, is part of your desire, the entire nature of the still, vegetative, animate, and human. Connect all of this to you, i.e., love all. You are going out to people because you need them; they must feel that your heart is open to them, that they are important to you, that your desire is directed towards them, and that through you a unique power descends to them. This is the first message. And after that the Arvut will be revealed in the whole world. This is the condition for the right connection of all the shattered vessels. How Does One Find Favor In The Eyes Of The Community? Baal HaSulam, newspaper, “The Nation”: It is shameful to admit that one of the most precious merits we have lost during the exile, and the most important of them, is the loss of the awareness of nationality, that natural feeling that connects and sustains each and every nation. Two thousand years ago, we felt ourselves as one people because all of us were as one man with one heart. This is what was called the “people of Israel,” and it doesn’t exist outside of connection. Today, we are not connected. Rather, we are huddled together, gathered like sheep because of the wolves that are ready to tear us apart. On the outside, we look like a people, but in fact, this is not so. This is our main and only problem. The Creator Himself supports all the other peoples. He supplies them with Reshimot and Lights that are drawn one to the other, so their nations are built naturally. The people only implement desires given from above. The Jewish people are different; we must build ourselves above our egoistic desire, in opposition to it. However, essentially, we are the biggest egoists because we passed through a Shevira (breaking). As a result of this, connection requires difficult efforts from us. The Creator doesn’t favor us. Rather, He only gives us the opportunity to connect. He creates external conditions so that we will implement internal conditions so that we will connect above our desire. If we do it, we will be fine, and, if we don’t, it will be bad. In this case, He will throw us out of the land. Of course, if we could live well in other countries, everyone would flee from here. However, the Creator sends us troubles and problems throughout the world, and in desperation, we have come to the land of Israel. Then He arranged troubles for us here, enemies surrounding us without any room for escape. Ultimately, there will be no nation, no people, who will feel any sympathy toward us. The entire world, everyone, will oppose us and won’t want any connection with us. We will be left alone here on a small strip of land, isolated, besieged, like the defenders of the ancient fortress of Masada, and we cannot do anything. If this does not work, the Creator, as Baal HaSulam writes, may scatter us again throughout the world. In our present state, we don’t deserve to live on this land, and basically, there is no place on the face of the earth to wander to. So, what is to be done? As a people, we must be an example for the rest of the peoples, but the thousands of years that have separated us from ancient Babylon have not changed anything. We are the small part that Abraham singled out from the Babylonian for correction. And to the degree that it is corrected, it will be able to influence the rest of the “Babylonians,” will be a “light to the nations,” and then all of Babylon will be corrected, the entire world will reach the long-awaited correction. So, it is up to us; first, we must unite according to the principle of “As one man in one heart.” It will be the birth of the spiritual embryo. Then is the turn of the principle of “That which you hate, do not do to your friend,” the level of Yenika, Katnut. After that, we reach “Love thy friend as thyself,” the state of Gadlut. It is incumbent upon us to pass through these three levels until the completion of correction, and then we will become priests to the world, as it is written, the “nation of priests,” (Exodus 19:6). Today, we see how hatred toward us grows and expands day by day. Even nations that were formerly sympathetic to us or were neutral will become hostile. No one will want to do business with us or deal with us in general. That is when we will feel besieged, completely isolated from the world. If we won’t change according to the laws of nature, or the laws of the Creator, that are coming down on the world now, then this will be our future until the war of Gog and Magog. In fact, it is happening now, but its external phase looms before us. And this is all because we are stubborn in not wanting to correct ourselves, and accordingly, we cause the activation of unbreakable laws. Question: Will the workshops that we conduct with the wider public help us? Answer: If we come closer to the hearts of people, softening them a bit, then we immediately will take a different direction. The main thing is to change the polarity from minus to plus. In other words, not transforming people from mutual rejection to connection, but at least bring them an inclination toward connection, at least so that they will acknowledge that the connection could indeed be salvation. Through this, we change direction, transform it 180 degrees, and this is a lot. This is because then the Light will illuminate in us positively. Question: What must the roundtables bring the people to? Answer: I suppose that, thanks to our work with those parts of the people who are ready to listen to us, we will change the attitude of people toward each other, for all of the people of Israel are not only responsible for one another, but brothers, and not just in times of trouble, but in times of happiness. Then we will see for ourselves that in connection there is a latent power that changes everything so much so that the government will not need to enact new laws. This is because, according to the Torah, we don’t need a king with his entourage. A spiritual kingdom dominates the people, and this used to be truly so. This is the only possibility for running a nation with the help of an equal connection between everyone on an equal level, without differences in levels. So, unique powers begin to act, and we hope that we will feel and learn about them quickly. Question: Even Baal HaSulam didn’t succeed in convincing people, so how can we? Answer: Well, Baal HaSulam didn’t succeed nor did Moses, Rabbi Shimon, or Rabbi Akiva, but you will succeed. Everyone needs to tell himself that the entire world depends upon him. If I thought that we wouldn’t succeed, then I would sit in my house and be engaged only with the wisdom of Kabbalah. However, how could you allow yourself to leave the world without help? Question: Why must we succeed where others have failed? Answer: We are living in a different time and in a different generation. We have received all that the great Kabbalists of the past have prepared for us in our hands, and we have brought the method closer to each and every one. And we need to continue forward, especially now. Only in the past year have we started going out to the people. Before then, we disseminated the wisdom of Kabbalah and attracted people in whom the aspiration for it was awakened, people with a point in the heart. But now, no person can be left outside the circle; everyone must join it. This is only the beginning. We still don’t know how to organize this so that all of the people will receive re-education and how and in what form it is necessary to do this to prevent bad development and reach the good. All this is really being clarified now. Baal HaSulam produced his newspaper before the war. Who could hear him then? But today, after all the blows and troubles, people are wiser. And besides, the entire world is covered by a general crisis. Nothing is sacred today. There are no people ready to stand on their principles no matter what. There is a decline in everything: helplessness, incessant threats, and growing anti-Semitism. All this frees up space for the true method and makes it possible for people to listen to it. The method itself is becoming more accessible. It has become clear that it is based upon the laws of nature and rational things, not upon beliefs or mysticism. All this is based on common sense. The method has developed to the degree that the connection between us has become stronger. We are the ones who have developed this method. It is impossible to compare what we have today with what we got from Baal HaSulam and Rabash. We received their articles, letters, The Study of the Ten Sefirot, and The Book of Zohar. That is all. But today, all of us together, students throughout the world, working among ourselves and with the external public, have milled these materials, on all of these materials, like through a grinder, and deduced from this a practical method of correction. Of course, we didn’t invent anything new, but we have started understanding the method, accepting it from Baal HaSulam and Rabash, and conveying it into practical footing. That did not happen before. And what will happen tomorrow, I don’t know, and so it should be. I see the distant future, but I cannot say what will happen tomorrow. Indeed, we need to create this method in practice. Theoretically, I do not know everything, but in practice it is born anew each day. Today we are building tomorrow’s level, and we see how we have advanced! Sometimes we are faced with difficulties and feel helpless and in doubt. How do we conduct workshops and attract people? What questions do we discuss? Are people ready for this activity or another? How do we tell them about the necessity of connection? We are looking for the way, and we are looking for it within us, because, in the meantime, we don’t have all the answers. It is as if we are taking care of someone, but, in fact, we are changing ourselves, and that is how it is day by day. This is the way, and it is possible to advance only in a this form. Question: You always say that people can advance through virtual study. Then why is it so important for everyone to physically gather at the convention? Answer: We operate in a huge and multifaceted world. In other words, in relation to the upper force, the Creator, the force of bestowal that influences me, I can be everywhere and in different states: closer or further from the center, some virtually connected to the lessons, some don’t even have Internet and they read books, others are physically present at the lesson, some are members of outside groups, and some do not have a group nearby at all. In other words, every person is where the upper governance has placed him or her. 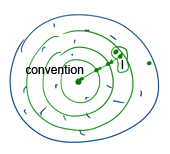 According to the strength of the influence, the physical location of our convention is in the center of the circles, and everything else is either closer or further from it. I need to understand that my presence at the central point during the three days of the convention provides maximum influence. This is why, if I have the freedom of choice to come and connect, I must come! But I need to find the strongest contact: this is my only freedom of choice. If you are in the same area of the convention, you can stay at home and watch everything on the computer; this is your choice. But you should know that it is impossible to compare the experience of being inside the convention site to not being there. We Hope To See All Of You In November! According to logic, there isn’t any freewill. After all, there isn’t any free movement; everything is controlled by the forces acting in nature and is subordinate to one upper force encompassing the entire universe. If someone feels differently, it is simply due to the lack of knowledge of the general system. If I am within the system in which I was born and which defines everything for me, how can I be free from it? The general force of nature acts, leaving no empty space, for the entire system is closed and works as a well-coordinated mechanism; so where can it give me freedom? There is no thought or desire in a person where the upper governance would not be present initially determining the person’s actions. Freedom begins when we wish to unite in the group with our points in the heart and begin to look for where we have free choice. We wish to establish a connecting field between us, the former place of the breaking. And this field, created with our ties, is the place of real freewill. It is another dimension, which has never existed before, a completely new plane of existence. If we discover a new space that never existed in creation, we exit this world into some other dimension, another world. We can say that are immersed into creation deeper and deeper and discover a tiny hole through which the entrance to infinity suddenly opens to us. In the same manner, having corrected the state of the breaking, we don’t go back to the initial stage that preceded it, but due to the fact that we have attained it through our freewill, we enter a new realm that never existed in nature: the realm of our freewill. We build a state among ourselves that will serve as a spiritual vessel: a new vessel, desire, will to receive (Tarach), and in it a new Light, NRNHY, which is 620 times greater! The names that existed before the breaking may have remained the same, but their essence has become completely different. This is why it is so important for us to find this point of our freewill where we will be able to break free into the new dimension.